My father is a famous painter in Bali called I Dewa Oka Wiri, so you could say that I was born into a family of artists! 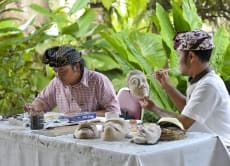 After painting for many years as a child, I continued my education at the Indonesian Institute of Art in Denpasar and now teach mask painting to guests from all around the world. Come and learn how to make these masks come to life and bring a handmade souvenir home.